As a very active soloist and a chamber musician in New York City, SoJin Kim has already performed in New York City’s most prestigious concert halls such as the Carnegie Hall, Avery Fisher Hall, Alice Tully Hall, and various other venues. Starting the piano at the age of three, and the violin at the age of eight, SoJin Kim won the gold medal at the Korean Noational Children’s Music Competition at the age of nine. Presenting her first solo recital at the E. Desmond Lee Concert Hall, at the age of twelve, she won numerous prizes including the first prize at the Laclede Quartet Student Competition, prize of Saint Louis Music Educator, first prize at the Moon-Wha-Il-Bo Competition in Korea, and the first prize at the Montreal Classical Music Festival Competition. SoJin Kim has also performed in the Steinburg Auditorium at Washinton University, and did the honor of playing for Maestro Hans Vonk and the Whitaker Society at Powell Symphony Hall. In 2006 SoJin won the Juilliard Concerto Competition, which resulted in a solo debut in Lincoln Center with the Juilliard Orchestra in Alice Tully under the baton of Murry Sidlin. 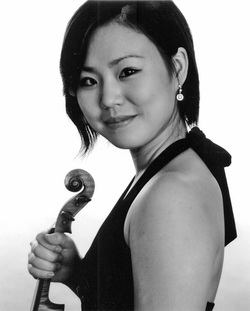 She has studied with David Halen, the concertmaster of the St. Louis Symphony Orchestra, Nam-Yoon Kim in Korea, Eleonora Turovsky, the concertmistress of Imusici de Montreal, David Kim, the concertmaster of Philadelphia Orchestra, and Hyo Kang. She has also worked with Donald Weilerstein, Zakar Bron, William Preucil, Lorand Fenyves, Zvi Zietlin, Anne-Marie McDermott, Victor Danchenko, and Janos Starker through private studies, various music festivals and masterclasses. As a chamber musician, SoJin Kim has especially worked closely with the members of the Juilliard String Quartet, and the Emerson String Quartet, as well as collaborations with artists such as Jean-Yves Thebaudet. SoJin Kim has earned her Bachelor of Music Degree at the Juilliard School, and is currently enrolled in the Masters Degree program studying with Cho Liang Lin and Naoko Tanaka at the Juilliard School. She is the recipient of Irene Diamond Graduate Fellowship.